Ellarslie: A Grand Estate in Cadwalader Park ~ The History Girl! Ellarslie Mansion sits atop a rising, gentile hill in the center of spacious Cadwalader Park in Trenton. This beautiful Italianate-style villa transports visitors back to a time when notable and well-to-do families resided on the western side of Trenton. Within walking distance to the Delaware & Raritan Canal and only a short distance further to the Delaware River, Ellarslie is a prime example of a country estate in the urban and post-industrial City of Trenton. In 1841, Henry McCall, Sr., a Philadelphia industrialist and a relative of the Cadwaladers of Trenton, purchased property in the city. McCall owned and operated a stone paper-mill which stood on the site of the Mahlon Stacy gristmill on South Broad Street on the south bank of the Assunpink Creek. In 1848, McCall hired architect John Notman to design a summer home in the Italianate villa style. Notman is known for designing the first Italianate building in America, called "Riverside," in Burlington, New Jersey and the first American Renaissance Revival building in Philadelphia. He also designed the 1845 expansion of the New Jersey State House, the State Hospital in 1848, and several buildings on Princeton's campus, including Guernsey Hall and Prospect House. Ellarslie is a brick structure stuccoed to simulate stone and painted a warm beige color. The mansion originally contained five main rooms plus halls on two floors. Notman’s placement of the “piazzas” on the west and south sides of the house suggests that Ellarslie’s architecture was designed to take advantage of broad panoramic views down the open slopes toward the Delaware River. The main house was supported by groups of outbuildings, including two pumps, an ice house, stables for four horses and four carriages, a gardener’s house, and a greenhouse. A farmer’s (tenant) house and a barn may also have been located on the property. The main entrance to Ellarslie was at Old Post Road, now West State Street, crossed the feeder of the Delaware & Raritan Canal via a bridge, and wound its way up toward Ellarslie. The treelined drive from the road to the bridge subsequently became known as Lovers’ Lane by the young couples who frequently strolled there under the canopy of American beech trees. Ellarslie in the early 1900s. In the early 1870s, the McCall family left Ellarslie and General Thomas Cadwalader used the mansion while his West State Street home was being rebuilt after a fire. For a few seasons, Ellarslie was rented to Ion Perdicaris. In 1846, Ion's family moved to Trenton and his father, Gregory Perdicaris, became wealthy as one of the organizers of the Trenton Gas Company. In 1904, Ion Perdicaris was kidnapped and his ordeal received international attention. In February of 1881, George Farlee, a New York broker, bought the mansion and property from the estate of Henry McCall for $25,000. Farlee used Ellarslie as a summer villa and farm, with some of the land set aside to raise Jersey cattle. The most significant change to the property occurred shortly after Farlee’s purchase when he subdivided a portion of the tract into small lots for the development of a residential neighborhood to the north of Ellarslie that was later called Hillcrest. In 1887, a committee of the Common Council for the City of Trenton sought a location for a city park. In September 1888, the City of Trenton acquired eighty acres of property from Farlee for $50,000. At this time, the Ellarslie estate consisted of a main house, a farm house, frame cottage, a small brick house, barn, carriage and tool house, machine shed and ice-house. Frederick Law Olmsted was hired by the City of Trenton to design the park. Olmsted is most noteworthy for his design of Central Park in New York City. Olmsted designed the park to include informal plantings, curved footpaths and roadways, highlighting its centerpiece, which was Ellarslie. Cadwalader Park, named in honor of the first mayor of Trenton, officially opened in 1902 and holds the distinction of being the only park in New Jersey designed by Olmsted. 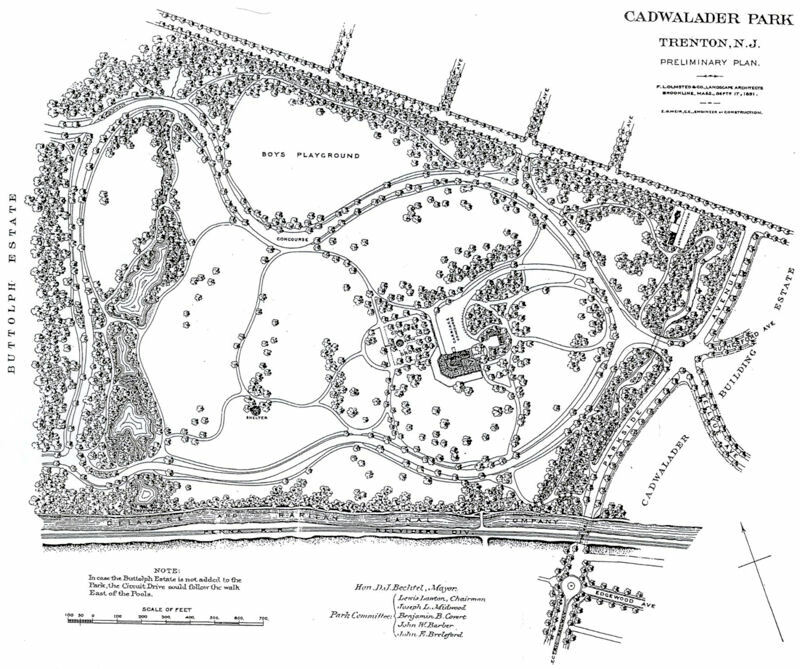 Preliminary plan for Cadwalader Park designed by Olmsted, dated September 17, 1891. In 1889, Ellarslie opened as Trenton's first city museum but the museum was short-lived. It closed only a few years after its opening. The mansion reopened as an ice cream parlor and later a speakeasy. In 1936, the home became the monkey house as part of the zoo that existed in the park. 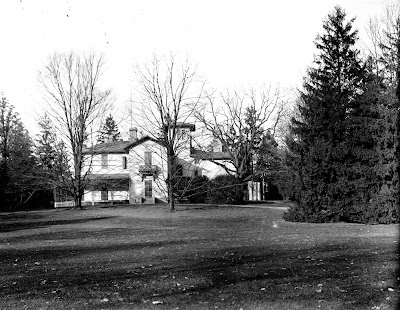 The home remained in that capacity until 1971, when the Trenton City Council passed a resolution to create an art and history museum at Ellarslie Mansion. Between 1972 and 1973, the mansion was placed on the State and National Registers of Historic Places. In 1974, extensive renovations began to create the current museum in anticipation of America's bicentennial. After four years of renovations, Ellarslie reopened in 1978 as the Trenton City Museum. Today the large, first floor rooms with high ceilings are host to changing art exhibitions by local artists. The second floor of the mansion has two rooms with permanent exhibits on Trenton's pottery industry. One room has been set up to display what a sitting room in a wealthy Trenton home may have looked like. Two additional rooms contain changing exhibits on Trenton's history. Currently, one room is devoted to the work of Trenton potter James Rhodes. Rhodes is a man who is mostly shrouded in mystery. Very little is known about his personal life, however over the past ten years much has been uncovered regarding his involvement in Trenton's pottery industry. In the spring of 2000, a pottery kiln was discovered on the Lamberton waterfront during the construction of the Route 29 tunnel. Over 13,000 sherds and pieces of kiln furniture (items used to help in stacking pots in the kiln during firing) were recovered from this site. The kiln is still intact, buried beneath the tunnel roadway. 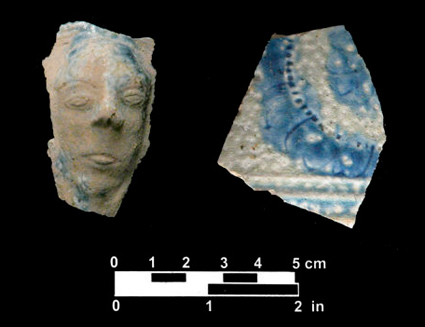 In 2005, a second kiln was found a mile from the first at the rear of the Eagle Tavern property on South Broad Street during its restoration. Hundreds more sherds were recovered. Historical documents and analysis of the artifacts established a link between the two sites. Due to this research, it is now believed that James Rhodes operated a kiln on the Delaware River from 1774 until 1777, working for the prominent Philadelphia merchant, William Richards. Then, from 1778 until his death in 1784, Rhodes ran his own pottery-making business on a property adjoining the Eagle Tavern site. Rhodes produced grey salt-glazed stoneware products and utilized signature decorative motifs that distinguish his products from those of other potters. He used floral designs, rough geometric patterns, and molded faces on some of his jugs and pitchers. Shielded from the hustle and bustle of city life, Cadwalader Park remains true to its founding and design as an oasis for urban dwellers. Green rolling hills, curved paths, and flowering trees lead you to the park's centerpiece, a country villa, sitting silently, awaiting its next visitors to find out what lies behind its wide veranda and imposing tower. This is a very informative article and a nice piece of research.